This page is written by the game's inventor, donald henry. row, from left to right of each player. combination; and may jump intervening pieces. straight or diagonal or combination. any time during the game. This move is called the escape. *note* in a certain barsoomian city-state "Manator" they have no knowledge of flying machines and they call the flier "Odwar"( and hereafter so do i) and he is synonymous with an earthling general. here is a quote from the book explaining my varied game etymology. "Instead they call him who stands next to the Chief or Princess, Odwar. The piece has the same moves and power that the Flier has in the game." opponent's Princess, or a Chief takes a Chief. ensuing ten moves, five apiece. move of a game where the Princess is taken. twice in a single move. This example explains combination moves. 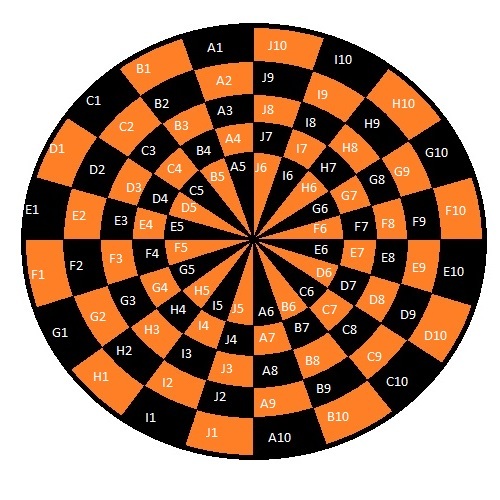 on the circular board the layout is such that the twenty center spaces are triangular and meet in the middle of the board (as there is no intervening obstacle as in traditional circular chess). this directional bias would displace the piece movement across center spaces by one space to the left or right(clockwise or counter clockwise as decided before play)of the homochromatic space 180 degrees in opposition to it in the center ranks. *as each file's fifth and sixth ranks are homochromatic and this would alter the behavior of movement between the two above mentioned spaces-the players decide(in jetan it's traditionally through gambling) which way this 'skewing of directional perspective' will alter the potential movement of the pieces across the fifth and sixth ranks(clockwise or counter clockwise). --again this alteration offsets true orthogonal and diagonal movement and displaces it one space to the right or left(A.K.A.clockwise/counterclockwise)as decided before play. **the panthan for example can move sideways,forward and diagonally forward one space and though the way the piece moves remains the same, the unique nature of movement across the fifth and sixth ranks allows for new potential threat/safety scenarios from otherwise impossible positions. The Ninth Ray is essentially an intentional detour both to add variety to the game play and to repair the discrepancy generated by the mechanics of the board. Here are a few situations to explain the alterations to piece movement under both clockwise and counter-clockwise directional biases. the ninth ray also plays into the mythology of the barsoom series in that they have two colors in their spectrum that do not exist on earth: Eighth and Ninth ray. The Ninth Ray when specially processed and mixed with the "Aether" of outer space mixes to create a functional atmosphere. -HENCE-the ninth ray creates the game's 'atmosphere'! -it is the only reason i bothered to try to add-on to the legacy of burrough's amazing game-i felt that homage could be paid and jetan deserved to have the natural progression of innovation and entropy observed (in regards to offspring and evolution) in it's many decades of static obscurity. "The Juggernaut, as its name suggests, is a moving force of destruction. At the beginning of the game, you place the Juggernaut randomly on the board. (You can place it in one of the four central squares, if it makes you feel more secure; or you can roll for any coordinates but it shouldn't make much difference.) Then, after every move, you roll a ten-sided die to see which way the Juggernaut moves. Unfortunately for the hapless chessmen(of mars), the Juggernaut(on barsoom dubbed "The Colossus Of Yorn") is completely indestructible. Anything it touches, dies. It will wander merrily about the board, destroying everything in its path, until nothing is left. If the die comes up 9, a momentary respite has been earned, and the colossus merely sits there, unmoving. On a 10(or zero), it teleports. *Roll the die two more times to pick a random rank and file. *the sole exception in this 'juggernaut-jetan' to earthling juggernaut behavior is that when ten or zero is rolled and when the coordinates are subsequently rolled for, a nine or ten/zero is not "re-rolled" as in standard juggernaut chess because jetan HAS a ninth and a ten rank and file! and due to this there are new draw conditions built in to compensate for the fact that there is a 2% chance the juggernaut may randomly teleport to the spaces occupied by a players chief or princess and in this circumstance of course there could be no winner and the game would be decided a draw.